Both of my children were attracted to this brightly-coloured book. In fact, they helped me to appreciate it through their eyes, as initially I had trouble appreciating the jumble of recipes − my eldest pointed out that the recipes were in alphabetical order by wacky name (there is an index at the back to assist adults). I wasn’t sure that there was much the children would be keen to make that I would agree to (the Dirt Pudding – made of biscuits, cream, chocolate and sugar was highly valued by the girls). The Hot Diggity Dogs and Crazy Slaw was the second choice and one easily made. I like to cook and bake and I think it is a useful skill to pass on to children. In the last year our family has been growing a lot of our own vegetables and the children now appreciate how long it can take to grow vegetables, and how delicious they are just out of the garden. 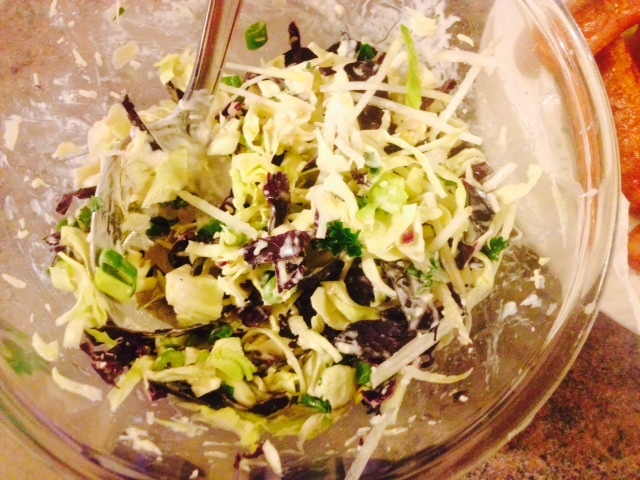 I was quite pleased that we were able to provide all of the coleslaw ingredients from our garden, bar the grated cheese. I think something really valuable that children’s cookbooks can do is show children variations on food that they find familiar. I’m sure if I’d suggested to the children putting cheese in the coleslaw they would have objected – but they were keen to follow the instructions! The Hot Diggity Dogs were delicious, and were a very quick dinner at the end of a hectic day. 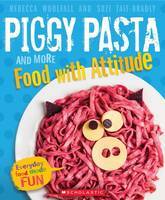 The front cover features ‘Piggy Pasta’ – pasta that has a beetroot and yoghurt creamy sauce. While garishly coloured, I know from my own family’s past ‘purple pizza’ experience that beetroot is a fun way to colour food, and one highly appealing to children. I learned along the way that my youngest loves baked beans. There is a recipe ‘Full of Beans’ teaching children how to make baked beans. My daughter asked for those “tomato sauce beans” (which I haven’t ever given to her because her older sister hates them) because, I guess, she loves anything in tomato sauce! She also noticed that the face decoration in the illustrations used olives for eyes − and I’d had great trouble guessing what they had used! Each recipe is illustrated with a large photograph and there are instructions within the recipes to ensure that children can replicate their appearance at home. For example, meals with funny faces on them detail what the authors used and how to prepare them. Something that I particularly liked is that the majority of the savoury recipes are vegetarian, widening the appeal of the book. To be frank, it is quite easy to find recipes for children with beef or chicken, but interesting vegetable based meals are less common. The ingredients used in the book are all readily found at any supermarket. What I would love from a children’s cookbook is some advice on cooking one recipe with two children of different ages. By the time we have all jostled for counter space, knives and negotiated tasks it can be quite stressful! When cooking from this book I had the oldest reading out the instructions and the youngest and I doing the prep work. It must be hard to put together a children’s cookbook. I suspect people must commonly complain that they are either too hard, too simplistic, too unhealthy, too healthy, too expensive, too fancy etc! I think though that the selection of recipes in Piggy Pasta is a reasonable balance and appealing to a wide range of ages of abilities. The authors, Rebecca and Suzi run Little Cooks − cooking classes for children in Auckland.